So you're in charge of a booth at a festival for children but have no idea what to have as your activity. 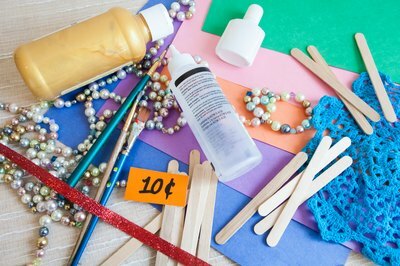 These festivals take place any time of the year -- for churches, schools, communities or other organizations -- and should feature activities for children that are simple to put together. Have a person stand behind a wall or fence. Or create a wall with items you might have. If you're using a fence, cover the fence with a dark sheet. The wall needs to be taller than the childrens' heads. Have fishing poles on one side of the wall. Create a fishing pole by tying a string onto a stick with a clothespin as the "hook." 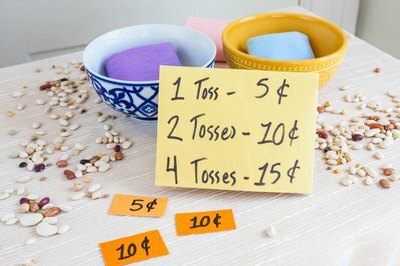 To play, attach the designated number of tickets the game requires to the clothespin, then toss the clothespin over the wall. On the other side of the wall, have a person attaching prizes to the clothespin. Have that person tug on the string when the prize is attached. The child can then pull the string back over the wall with his prize. Set up large bowls or plates in a pattern in your booth, or put masking tape on the floor in various shapes. Place a piece of masking tape in a straight line where you want the kids to stand behind. Have the kids toss bean bags at the targets. Charge one ticket for one toss, two tickets for three tosses, three tickets for six tosses, etc. Provide prizes designated for the different targets the kids hit. 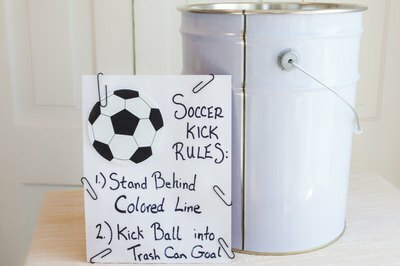 Set up a net or other target like a tipped-over, plastic trashcan. Adhere a piece of masking tape to the floor to designate where the kids must stand. Allow the youngest children to stand closer. Have the kids take turns kicking the ball into the target. Like the bean bag toss, charge a certain amount of tickets for the amount of kicks. 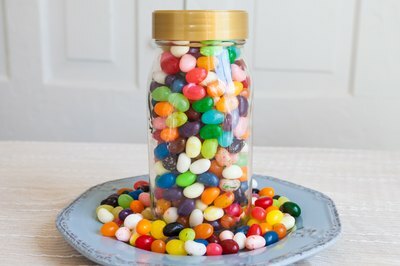 Fill a jar with jellybeans, chocolate kisses, pennies or other small items; alternatively, fill the jar with a holiday-related item, such as conversation hearts, if the game is for a holiday festival. Ask the kids to guess the number of items in the jar. Then give prizes for the children with the best guesses. Give a larger prize to a child who guesses within 10 of the correct number versus someone guessing within 100 of the correct number. Give the filled jar as a prize to children over 3 years of age, if the item is child-safe. Recruit volunteers with face-painting experience. Set up a booth with chairs for the face painters and the children who have their faces painted. The more intricate the design, the more tickets it's worth. 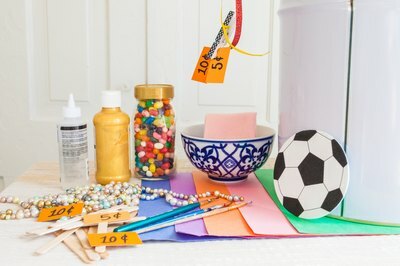 Set up a craft booth with stickers, markers, school glue, safety scissors, craft sticks, string, empty and clean milk cartons, construction paper, etc. Recruit volunteers to teach and help the children with their crafts, especially more structured ones such as bird feeders. 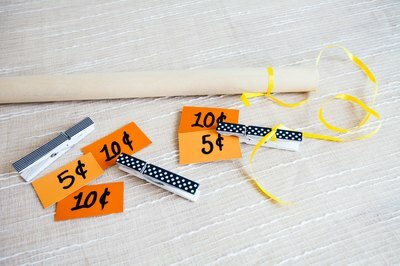 The number of tickets will determine the type of craft the child can make.